Our mission is to protect Patagonia as an environmental and cultural destination through responsible and well planned trips. Through our adventures, our hope is to instill in each of our guests value and wonder for the landscapes and gaucho culture that remains today. Our goal is to deliver a tourism experience that is innovative, memorable, authentic, ethical and that can really change the lives of our guests. 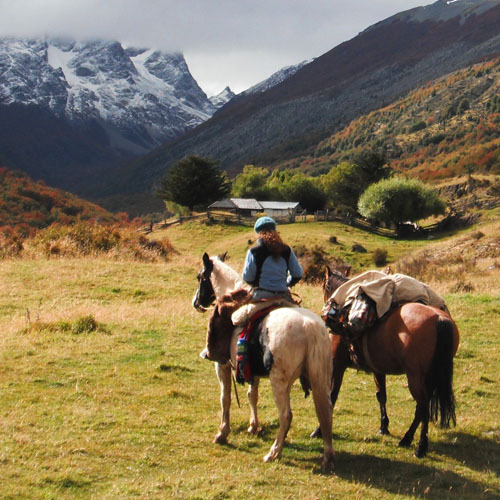 Senderos Patagonia is a family owned adventure tour business based in the town of Cerro Castillo, one hour from the regional airport, Balmaceda, and only an hour and half from the capital city of the region, Coyhaique. We specialize in small group sustainable travel, in particular trekking expeditions and horse pack trips throughout the southern portion of Aysén. As locals, we are dedicated to providing an unforgettable experience by taking clients off the main tourist track and bringing to life the culture and beauty that our part of Patagonia has to offer. Our company has developed a strict risk management plan and hires only the most qualified guides and staff to ensure guests’ visits here are safe and enjoyable. Mary and Cristian started the company in 2010, but both have worked in the region for many years beforehand. 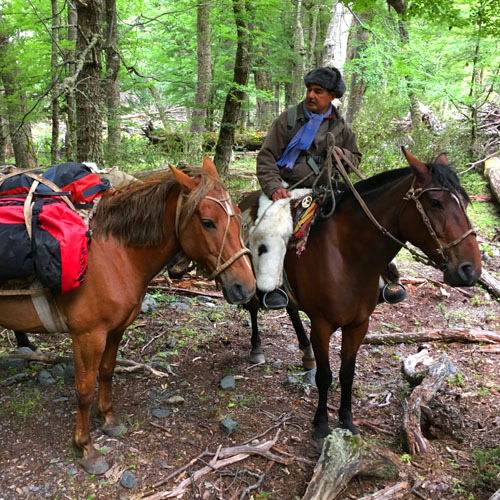 A first generation graduate from the Guide School of Patagonia and local, Cristian is an advocate for the environment and cultural traditions. Mary contributes to the company not only as a guide, but with a Bachelor’s degree in Ecotourism and Master’s in Outdoor Education, offering insights in managing and developing the company responsibly both socially and environmentally. Our company is committed to following international sustainability criteria in regards to the quality of our services and operations. When hiring, our company first looks for potential guides in the region of Aysén before looking outside the region or country. Investing in our guides through first aid certifications, cultural workshops and more is what sets our company apart from others in the area. We take pride in community tourism and visit local restaurants and hire local transportation for our groups. 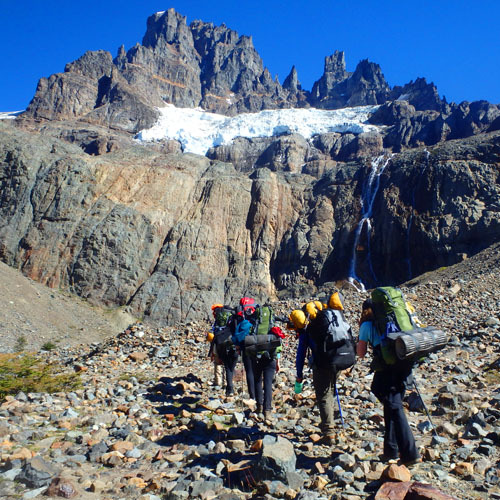 Additionally, Senderos Patagonia’s owners and guides continuously volunteer in the national reserve cleaning garbage and maintaining trails, as well in local and regional organizations in both environmental education and adventure tourism. We believe that instilling an environmental conscience in locals not only pertains to adults, but begins with the community youth and strives to provide opportunities for learning and education in the local school of Cerro Castillo through workshops and field trips. As a fundamental frame of reference for responsible and sustainable tourism, the Global Code of Ethics for Tourism (GCET) is a comprehensive set of principles designed to guide key-players in tourism development. It aims to help maximise the sector’s benefits while minimising its potentially negative impact on the environment, cultural heritage and societies across the globe. The Leave No Trace Seven Principles provide guidance to enjoy our natural world in a sustainable way that avoids human-created impacts. The principles have been adapted to they can be applied in your backyard or your backcountry. The GSTC Criteria are the guiding principles and minimum requirements that any tourism business or destination should aspire to reach in order to protect and sustain the world’s natural and cultural resources, while ensuring tourism meets its potential as a tool for conservation and poverty alleviation. Chile has decided to move towards a sustainable development of tourism, and with it, sustainability was defined as a relevant axis for the development of national tourism and the country’s tourist destinations.